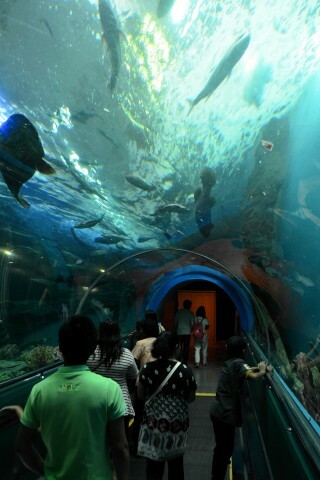 Photo: One of Thailand's better aquariums. Complimented by well-put-together displays in Thai and English, Rayong Aquarium has an excellent collection of tropical fish and other marine life found in the region. Browse places to stay in Ban Phe on Agoda.com. Free cancellation. We reckon it’s one of the better aquariums in Thailand. Dozens of individual tanks are home to painted sweetlips, spangled emperors and many other extravagantly named tropical fish. In the largest tank, black-tipped sharks lurk among several plus-size fish. Highlights include a tank with a pair of green sea turtles and a glass-walled tunnel where the sea life swims around on all sides. Also check out the displays of coral and “dangerous marine life” -- good stuff to know if you’ll be snorkelling or diving in the area. The aquarium offers several well-done info boards, including picture displays covering all of the whale and dolphin species found in Thai waters. A separate museum-like section explains the area’s fishing lifestyle alongside fishing nets and pictures of locally made boats. We appreciated how the aquarium projects a real sense of pride in the local ways of life and natural environment. A lack of double pricing for Thais and foreigners is also appreciated. If you come on a weekend or holiday, expect to be swept up in crowds of mesmerised kids. After spending a half-hour in the aquarium, walk over to the coast for a good view of Ban Phe. Last updated on 24th April, 2016. Rayong Aquarium is located three kilometres southwest of downtown Ban Phe in the village of Pak Khlong. Head west from the piers in Ban Phe along Liap Chai Fang Road and continue straight, passing under a gate, on Sukhaphiban Soi 2/8. After passing through the seafood market, a left turn will take you straight to the aquarium. Open Wed-Sun 09:00-16:00; open until 17:00 on Sat-Sun.